The X-15 was possibly the most successful and important experimental aircraft program the world has ever seen. It was truly a "stretch goal" to strive for Mach 7 when the most recent X-planes had just broken Mach 2. Hypersonic is certainly the most comprehensive history of the X-15's development, operation, significance, and the people who made it happen. The authors do a great job making this clear in their introduction. They certainly caught the enthusiasm for the subject shared by all the people who worked on the project. Scott Crossfield and William H. Dana, the first and last X-15 drivers penned forwards and certainly contributed greatly to the book. This isn't a dry history, or just a photo album, it's a story and it's a great one (and a history and photo album). The book is massive; it features more than 500 photographs, drawings, charts and color plates. Units cover the antecedents as well as development, operation and follow-on concepts. There's a statistics appendix, selected biographies of key individuals, and a full flight log for all X-15 flights. That log also includes data about the chase planes, NB-52s and those pilots and crews. It's a tremendous amount of information. For the modeler, it's a true wealth of information. Included are detailed descriptions, photos and information about the evolution of the planes, the equipment and even mission-specific gear. Actually, there were too many pictures for one book and the authors published a second book, with 400 more pictures and illustrations titled X-15 Photo Scrapbook. 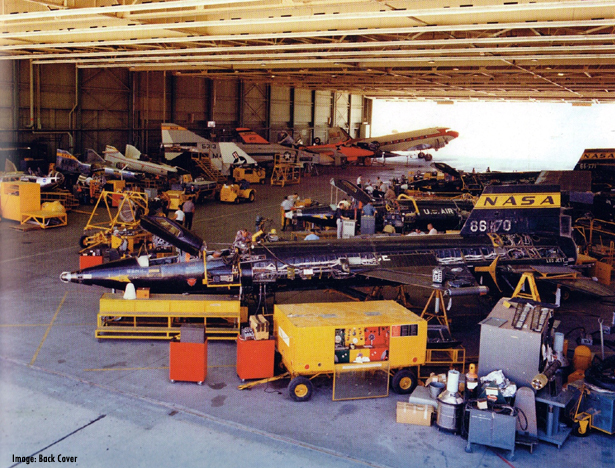 There are pictures of all phases and configurations with gems like the X-15 on flatbed trailers with California license plates on the plane. If you've ever wanted to detail a model or build a diorama of the plane it's all here. The ideas not followed and the pitches for further projects are fertile ground for the ambitious scratch-builder or kit-basher. There are publishers I've come to regard very highly. There seem to be no books from these publishers I wouldn't feel comfortable buying - or winning their entire library in a lottery. Osprey is one, Baen SF is another, and Specialty Press is also in that rank. They're just great books, well-researched and engaging. I highly recommend Hypersonic: The Story of the North American X-15 by Jenkins and Landis. This page copyright © 2009 Starship Modeler. First posted on 9 January 2009. Last updated August 28 2015.